9:40:00 PM I got Juan and Aamal about a week ago. Best pets I have had so far. Good thing about having 2 is you can alternate (unless you can handle 2 at once). I would have to say they are pretty rare though. I looked around W and SW of doeba guerfel for close to 3 hours, only finding Crimson babies, then found and tamed 2 within 10 min. It was totally worth the time. 8:01:00 AM Tamed one yestarday. Thanks for my taming clothes, It was pretty easy. Pretty fast, It can easily keep up with my speeder even as an baby. Great pet. 7:26:00 PM Tamed my first razor cat today. It was a good way to end the day. Earlier I had written down some coordinates that I saw some lairs at, when I went back there was nothing. I kept on going south of doeba guerfel, came to river, and saw some red arrows, followed the red arrows and there it was. In a nice little lair sat a baby razor closest to me, and two adult females not too far away. I tamed the baby on first try and went home for the day. 12:32:00 AM Technically, that last one was my post. Not sure what happened with the "anonymous" thing. 12:30:00 AM I used on of these for a long time, even after I could tame CL 22. Incredible for the level, "Leo" was best fighter at the time. He is also loyal, almost to a fault: he will attack anything that attacks me, and I sometimes have quite a time getting him to back off. 7:23:00 PM You can find Razor Cat lairs via a mission terminal. They're level 30, about 6600 credits. 11:41:00 AM Razor cats are pretty good in my opinion. Their primary special attack is an Intimidate attack, which is great once you can order them to use it on command. Once they manage to intimidate their target, they effectively gain 50% resistance to every attack from that mob, *before* any other resistances are even applied. This can actually make them pretty competitive when compared to a Sludge Panther or Grand Wrix! Plus, as many have said before, these cats are VERY fast. They can almost keep up with a Speederbike without quickly falling behind, though you need to stop every once in a while to let them catch up a bit. Also, their fast speed makes them great interceptors for ranged attackers, for when you have a mob chasing you and you need it to stop so you can get range for your weapons. Just keep hitting Peace and telling the pets to attack it, and it will usually stop chasing you to melee the pet. Razor cats make very good pets for CL22. I think they're pretty hard to beat for their level. 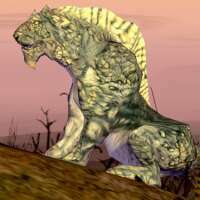 4:12:00 AM Any one know were i can find some razor cats on the Europe-FarStar Server??? 10:31:00 PM Found and tamed both male and female razor cat from one nest. The nest was at 4837 4588. I was just running around the coords given by "sighting" here. 5:58:00 PM I looked for crimson razor cat babies for 3 days.2nd day found 1,but it agroed on me on first tame attempt.I had to run,and when i came back to try again it was adult.3rd day found another and tamed on second attempt.Havent seen a baby since...and I really want two. 9:11:00 AM I've been searching Corellia for 3 days trying to find a Razor Cat baby and after clearing 4 nests all I find are Razor Cats, Female Razor Cats & Female Razor Cat Scouts, Crimson Razor Cats, Razor Cat Cubs, with the only babies being the female and Crimson Cat babies. Are the Razor Cat Babies particularily rare for a lvl 22 pet? ?